The evaluation scores and comments are about what I expected. 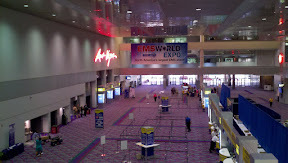 I thought I would share the responses to the question “Are there any sessions or topics you would like to see added for for future events?” as this might inspire you to submit for EMS World Expo 2012 in New Orleans, LA. Is online training good for your department? Would like to see a session that actually teaches you/works with student on how to use technology of online EMS education. Tools, tricks, etc. Also consider these hot topics. Next articleDo We Really Need More POVs with Emergency Lights?